The following are detailed specifications about the 23-Watt Warm White PAR38 Compact Fluorescent Light Bulb. 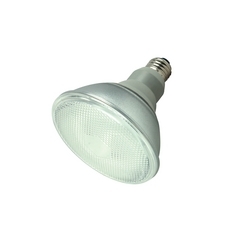 Equivalent to a 75-watt incandescent this lamp is rated to last up to 10000 hours. The 2700k color temperature mimics standard incandescent light and is great for living bedrooms and dining spaces. This 23-Watt Warm White PAR38 Compact Fluorescent Light Bulb is part of the $item.xCollectionName Collection from Satco Lighting. The following items are also part of the $item.xCollectionName Collection.